This volume is dedicated to the study of three late, little-known biblical works that historically have been relegated to the lesser works of the New Testament. Reading 1 Peter, Jude, and 2 Peter underscores the light that these letters shed upon one another and focuses on the snapshots they provide of early Christian communities as they encountered the social and religious environment in which they were situated. 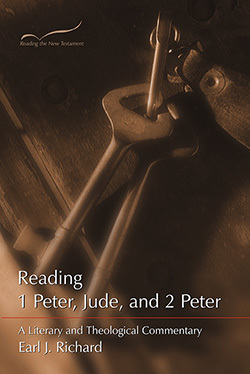 Careful reading of 1 Peter reveals the complex world of the post-apostolic period. Jude and 2 Peter provide a sober look at the early community's evolution in doctrinal and moral terms. Earl J. Richard is Professor of New Testament at Loyola University in New Orleans. He holds graduate degrees in theological and biblical studies from the University of Ottawa, Johns Hopkins University, and the Catholic University of America. He is the author of many books in the area of biblical studies, past president of the Society of Biblical Literature (southeast region), and a member of the Catholic Biblical Association. Edited by Charles H. Talbert, Distinguished Professor of Religion at Baylor University in Waco, Texas, the Reading the New Testament commentary series presents cutting edge biblical research in accessible language that is both coherent and comprehensive.